Kays Kids: It is the Ho Ho season. It is the Ho Ho season. It's is getting to the HO HO!! Season. I can't believe it Presents are arriving already. 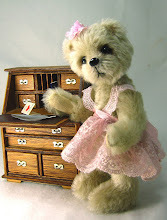 Dear Janice from Booh Bears sent Granny this lovely pin keep,because she won it in a give away. Of course I had to open the box. I am very good at opening presents. Both Granny and I think this pin keep is so, so pretty and special because it came all the way from the United States. It has a very sparkly flower on it. I think it is real diamonds don't you? 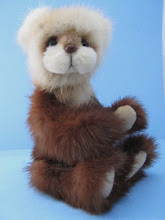 Granny is just finishing off two little bitty bears, So I am looking up some of Granny's Patterns for a new one!!! Can you see me waving to all the Children that go past my window. I love seeing the smiles on their faces. 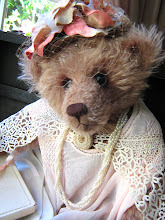 This is a quick photo of one of Granny's bears she has finished. Well that is wrong... she hasn't finished it at all. But nearly. 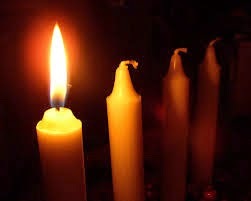 Happy First Advent Sunday to every one. There was too much excitement today opening that beautiful parcel, so I am settling down for supper of toast, honey and peanut butter, with a COLD glass of chocolate milk because it was hot today. These flowers are from Granny's garden. They are for all our beautiful followers. "Every one is a Genius. But if you judge a fish by it's ability to climb a tree, it will spend it's whole life thinking it is stupid." Granny's pin keep is bee-u-tee-ful, so is her newest bear. You two sound beary busy getting ready for Christmas. I think you look handsome in that Santa hat. Красивые фото! Мысль недели очень понравилась! Hi Wilbur, you look great with a Christmas hat! The pin is lovely. Granny's new bear is beautiful! The thought for the week is so true :-). Hugs Kay & Wilbur! Ohhhh Wilbur, wat een prachtige kerstmuts heb je op, en dan dat geweldig cadeautje in zo'n speciale verpakking, dat ziet er er erg mooi uit. Prachtig kay de foto van je nieuwe beer, zo lief dat gezichtje en mooi de ogen. Wat een feestelijk aanblik de erker met de Kerstboom en Wilbur, zo leuk. Mooi Kay de bloeiende bloemen bij jou in de tuin, is dat de "Valeriana officinalis" valeriaanplant??? WEns je een mooie week toe, en succes met het voltooien van de beren!!! What a lovely pin cushion you won! Congrats on that one. Love your bay window, almost the same shape as our kitchen bay window. Happy 1st Advent week to you and enjoy what you are doing. What a pretty name? a pin- keep. I wouldn't sit on it Wilbur in case Granny put one of her pins in the wrong way!! Thank you for the lovely flowers they will sit perfectly on my kitchen table. We lit our first Advent candle at church on Sunday - the candle of Hope - and reading your post was another lovely way to help us celebrate the first Sunday in Advent! I bambini saranno molto felici di passare davanti alla tua finestra! Sei un orsetto molto dolce! Hi Wilbur! waving at the little children.....bet you know them all and they all know you! You have a lot of friends, I'm sure!!! Maybe I'll get me such a lovely hat too and start waving at the kids too! Looking forward to see their smiling faces! Your Granny got a very nice pin-keep; she is very happy with it don't you think so? Have fun little friend and enjoy all these "Christmas-things" going on! Big hugs to you and Granny! I loved seeing all your sweet photos especially the one of you waving through the window next to the tree. 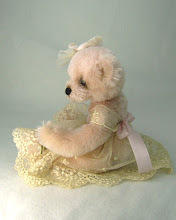 Congratulations on the sweet pin keep and how adorable the sweet little bear is you are making.